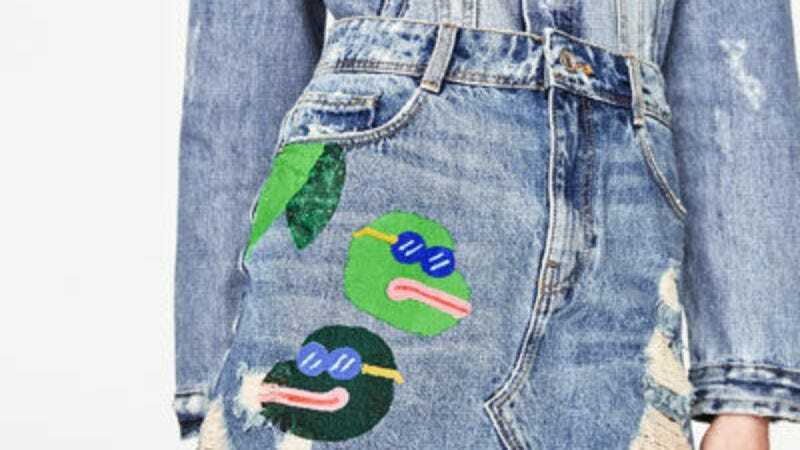 It turns out that internet hate isn’t just trending, but trendy, as clothing retailer Zara released its spring line this week featuring among its various blouses and shirts a skirt with a design closely patterned off of online human ugliness symbol Pepe The Frog. Sidestepping the fact that artist Matt Furie—whose harmless design has been ruthlessly co-opted by “online satirists” who consider “kill all Jews LOL” as the height of internet comedy—almost certainly wasn’t compensated for its use, the company’s choice to emblazon its fresh April fashions with a picture branded as a hate symbol by the Anti-Defamation League was a weird one. But hey, that one was an honest mistake. It’s not like Zara also produced purses that just straight-up had swastikas printed on them.